Some glorious sunshine and mild temperatures have given way to a cold icy wind again today. Nonetheless my outdoor spring pots planted up a few weeks ago have yielded enough for two little vases to bring indoors, so I can join Cathy at Rambling in the Garden for her Monday meme. The only flowers here that are actually growing in the garden are the Hellebore (Double Ellen Purple) and an Iris reticulata (Harmony). The violas were all planted last autumn, and every year I fear they will not withstand being frozen solid for weeks on end, but they do! They look terrible in February, blackened by frost and soggy from the damp, but then suddenly they start turning green and producing buds. I have also included some forget-me-nots, a yellow Primula, Bellis, miniature Narcissi, Veronica ‘Big Blue’, and an Iberis flower. The Iberis and Narcissi will be planted out in the garden eventually. My craving for some winter colour is not limited to the garden however, and – as you can see – the bright pink/orange cushion cover I have been crocheting has crept into the photos! I hope you have some colour to enjoy this week, and if your Spring still hasn’t arrived, do go and visit Cathy and all the other vases that are linked in for a big dose of spring cheer! This entry was posted in Flowers, Garden, In a Vase on Monday and tagged Cut Flowers, Garden, Seasons, Spring. Bookmark the permalink. Hi Eliza. I wonder if there are signs of spring your way too. Have a sunny weekend! We’ve had a couple warm days at last… the snowdrops are emerging and I saw a crocus today, too. I raked a bit this afternoon, it felt good to be out scratching in the garden! All that color will brighten up your house. Your crocheting was the first thing I noticed. 🙂 The cushion is finished and the weather is warming up nicely. What bright little vases these are, ably assisted by your equally bright props – the paper napkin is a great accessory! Thanks Cathy. I shall continue to raid the pots until my garden daffodils finally open! 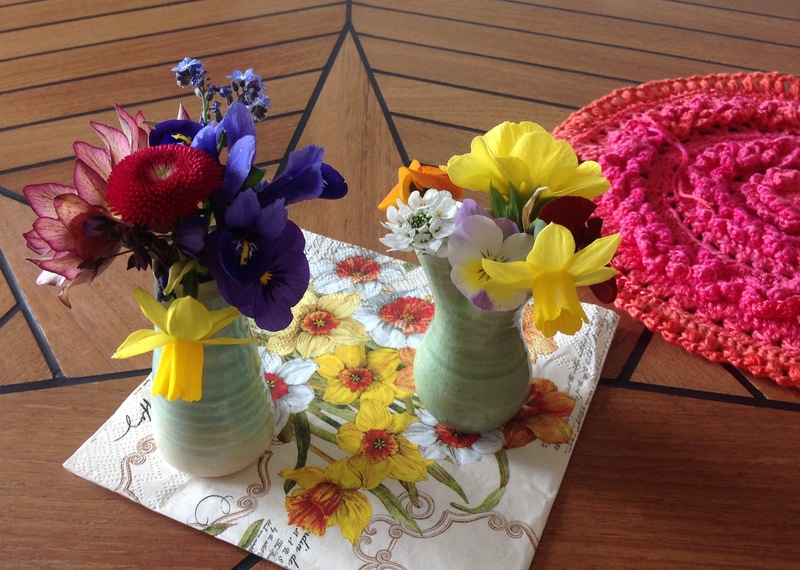 Cathy that magnificent two small and wonderful vases full of Spring treasures! I love them like the flowers they contain. 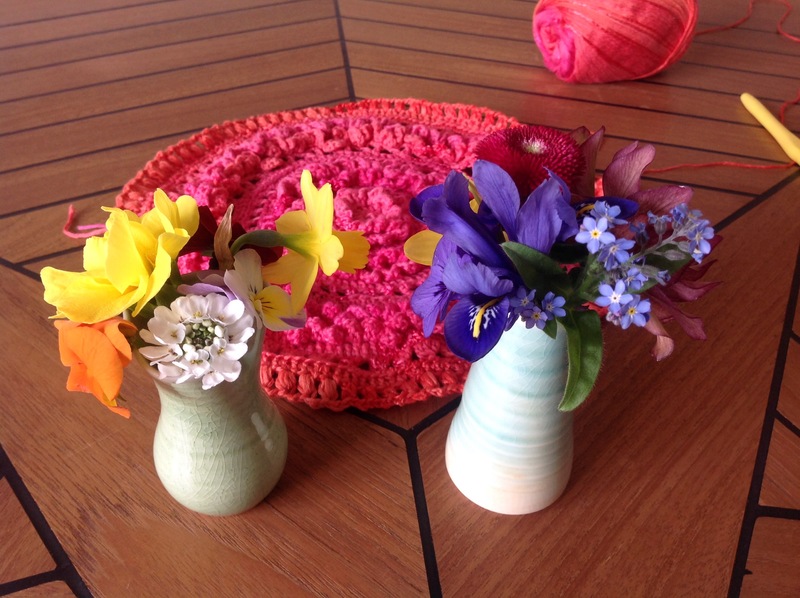 You have a great collection of Spring flowers that I love: Narcissi in miniature, Violas, Iris reticulata “Harmony”, Hellebores …… You are very industrious doing crochet: I tried it and it did not work out. I feel very much with all my heart that after a few days of good weather the cold has come again. Look at your vases and enjoy them. Have a wonderful week. Keep the heat. Take care. Greetings from Margarita. It is up and down with the temperatures here too Margarita. Up at the moment, so good news! Hope spring is coming your way too. Have a lovely weekend! You did a beautiful job displaying your pretty Spring blooms, Cathy. Tiny arrangements are often the most satisfying in my view. Our weather keeps pulling oddly dramatic shifts between warm and cooler-than-usual temperatures too, not that I’m complaining – the cooler temperatures due this week are expected to bring us a little more rain, which is always welcome. I get the impression you have had some good rains this winter. We are hoping for some damp weather in April and May this year after months of practically zero rainfall last spring. It’s amazing what plants can withstand. Your tiny vases look perfectly beautiful. Thanks Alison. The violas and the hellebores are such resiliant plants! 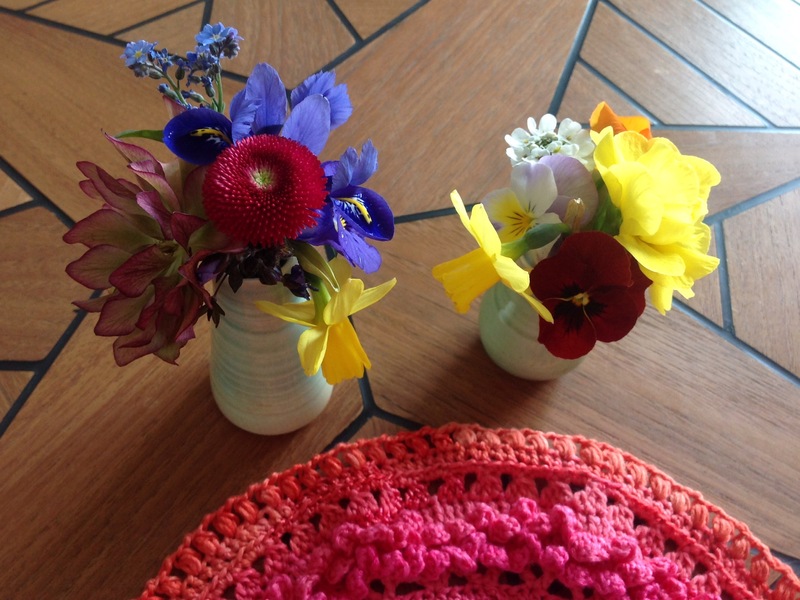 I love bringing in little posies in spring, these two are such lovely jewel like colours. Absolutely. My spring pots are like little treasure chests! Oh, they look so cartoonish. I happen to really like forget-me-nots. They are such a perfect blue! I would not have thought of cutting iberis. It is strictly a bedding plant, comparable to alyssum; but then, so is pansy . . . . and they are popularly cut for this meme. One thing I have learned from this meme is that absolutely Anything can be cut for a vase! LOL! Yes! When I get more ‘time’ (yeah, right), I must try it myself! I bet I can come up with some really odd ones. Seeing some of what others use makes one look at their own flowers a bit differently. If I had honeysuckle, I would SO want to show it off. I also want to get some mustard flowers. Well, you know how easy it is to get carried away! And so welcome when the temperatures drop and the sky is cloudy! Wow, your bellis is huge. Mine are only normal daisy sized! Such lovely bright colours in your vase. Isn’t it great that Spring is creeping in? Oh yes, about time too. It has taken much longer than usual for the ground to warm up. Oh no! I hope there is only minimum damage. Especially after losing them last year. Did you see Amelia’s post? Her Wisteria is already opening! How very pretty, and bright, just like you said! How big is that hellebore flower? It seems huge, but perhaps it’s just the perspective? Nice job on the cushion cover too! Thanks Kimberley. 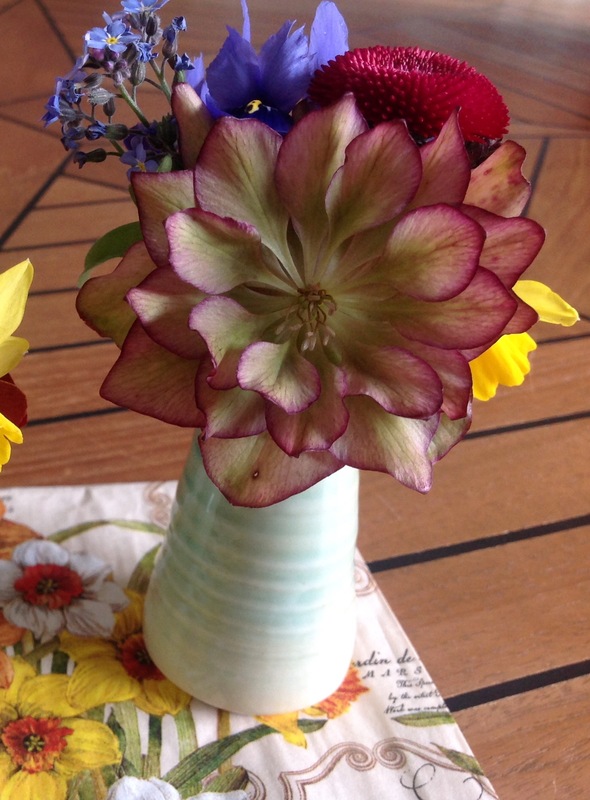 The hellebore does look big next to the tiny posy-like flowers, but is fairly average size for hellebores. I am glad to hear you are enjoying spring flowers now Debra! There really is nothing like it when the bulbs start shooting up everywhere and the world is slowly getting greener! Your vases are so full of smiles! 😀 as is your crochet! It is so nice to get some colour into one’s world again, isn’t it? Your pretty little pops of color by nature and yourself are so pretty. Welcome spring. Thank you Karen. Yes, Spring has finally sprung here with a lovely sunny weekend to celebrate. Shame it was an hour shorter than usual as daylight saving started today! Happy Spring!